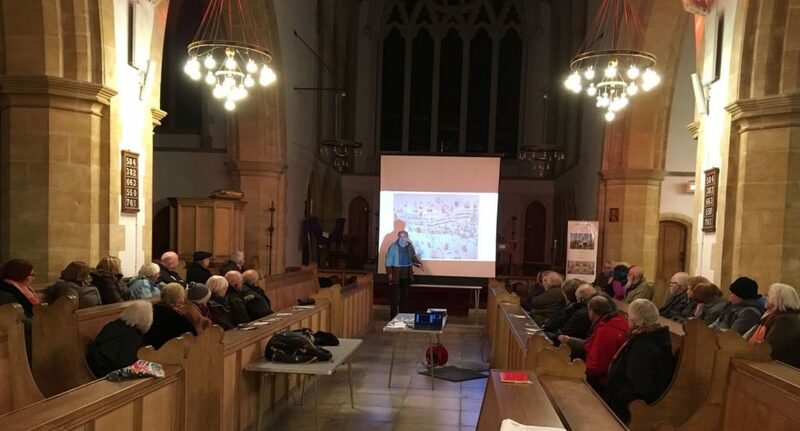 On the evening of Monday, 5 March 2018, in Great Yarmouth Minster, Norfolk Record Office (NRO) staff Nick Sellwood and Frank Meeres gave presentations about conserving Great Yarmouth’s first parish register and its history. A previous blog gives some background information to the register and explains why it is so important. This blog focuses on the conservation of the register and future events relating to this work. Nick Sellwood, Senior Conservator at NRO, carrying out repair work to a page of the Great Yarmouth parish register. Thanks to a generous donation made by the Towne Family Association and NORAH, the NRO has been able to conserve the register. 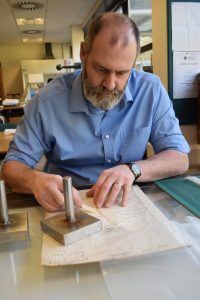 At the event on 5 March 2018, Nick, senior Conservator at the NRO, spoke about the conservation work he has undertaken so far, which has included taking apart the old binding and repairing some of the parchment pages. Nick will then rebind the volume, reusing the original leather and boards. Nick’s first task was to take apart what remained of the binding. An archive conservator always wants to reuse as much of the original volume as possible. As a consequence, Nick was careful to remove the original leather from the front and back boards. The detail on the original leather is particularly noteworthy. The original leather from the front of the Great Yarmouth register. The NRO conservator has removed the leather from the original boards. They are probably oak. Many of the parchment pages in the register have pieces missing and are weak. Nick needs to fill and strengthen these holes. He cuts a new piece of parchment to fill the gap. This is then held in place by goldbeater’s skin. Archive conservators always make sure it is obvious what work they have carried out. As such, archive conservation differs from other types of heritage conservation. 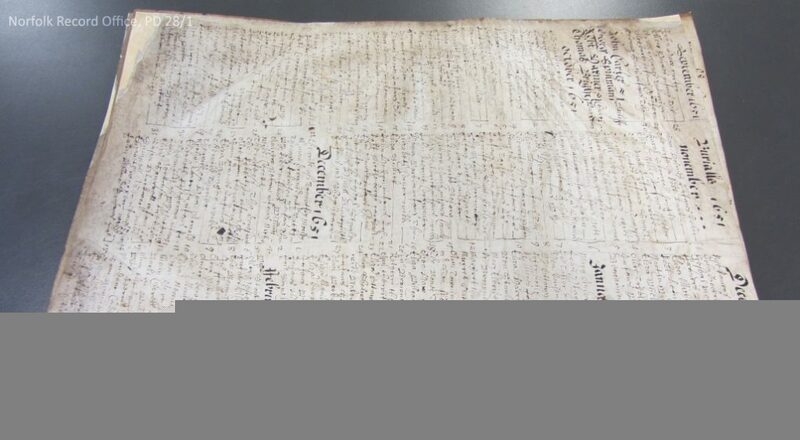 In the past someone has used the register as a cutting block and repaired the resulting damage with self-adhesive tape, which has stained the parchment. Nick has removed the tape, cleaned the staining as much as possible and repaired the cut using professional techniques. 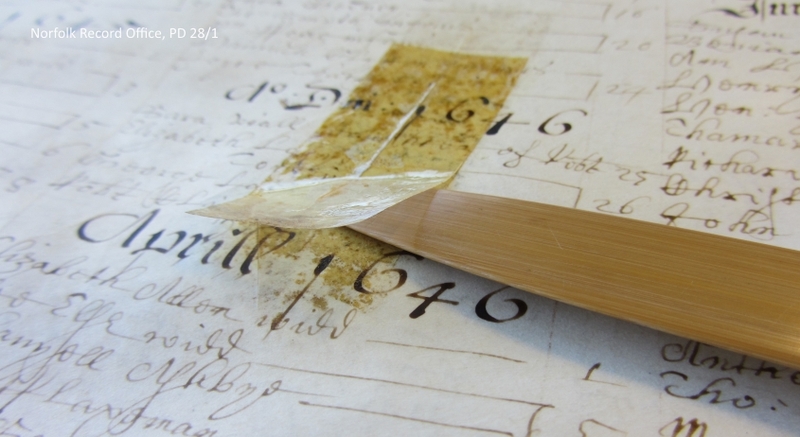 An example of a parchment repair carried out on the first Great Yarmouth parish register. An NRO conservator has now cleaned and repaired this cut using professional techniques. 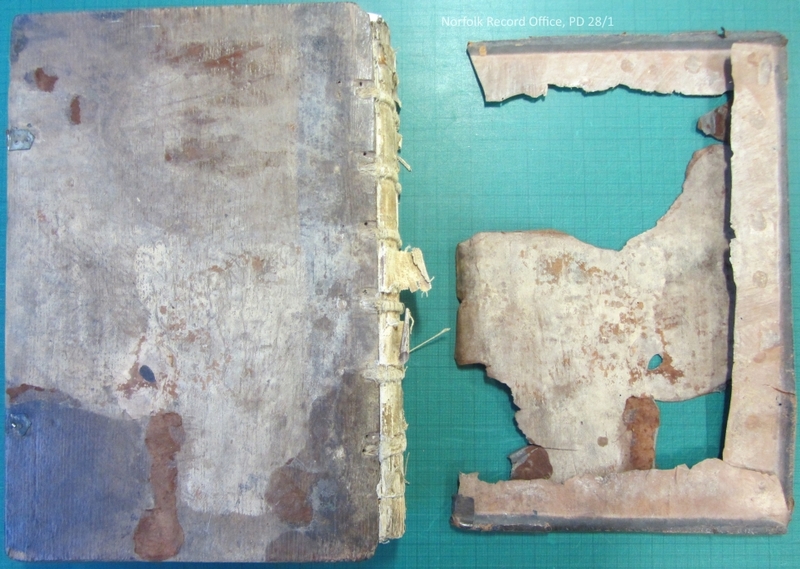 The NRO conservator has cleaned, flattened and repaired this page ready for rebinding. This note appears at the back of the register. Who is Samuel Bridgman? Conservators are always keen to know if any previous conservation work has been done on a document and by whom. Nick found an intriguing note at the back of the register on an otherwise blank page. 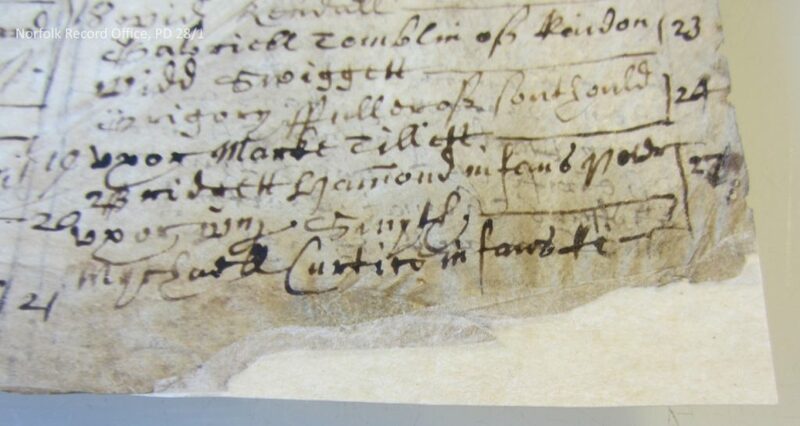 Could this be a name of a Norfolk-based conservator operating in the nineteenth century? The note read, ‘Sam[u]el Bridgman. Litcham, Norfolk, June 14 1831’. Alas, Samuel was not a conservator. According to the 1851 census, Samuel Bridgman was the ‘manservant’ of George Hills, the then incumbent of the church of St Nicholas. Samuel may have started his employment for one of George Hills’s predecessors on 14 June 1831. Samuel was born in about 1811, which means he would have been about 20 in 1831. Frank Meeres talking to the audience about stories from the Great Yarmouth parish register. At the event on 5 March 2018, Frank Meeres, archivist at the NRO, spoke about the history of Great Yarmouth using stories from the parish register. For example, he noted how dramatic increases in the number of burial entries suggests plague outbreaks. With over 60,000 separate events and over 130,000 names recorded, the register is a vital source. Also at the event on 5 March 2018, a pop-up exhibition from NRO was displayed for the first time. Due to popular demand, a similar event will take place at Great Yarmouth Library on 29 May 2018 at 2.30 p.m. where the exhibition will be on display. The exhibition will also be on display at the Great Yarmouth Maritime Festival on 8 and 9 September 2018. THANKS SO MUCH FOR THIS BLOG! This helped our Towne Family Association learn how conservation and repair of the Great Yarmouth Register was accomplished. And you have thoughtfully included our name and a link to our organization in your blog. It has been a pleasure to work with you and help contribute to this very worthwhile project. Hopefully, in the future we can return to England and see the conserved and repaired GY Parish Register first hand. Thanks for keeping us informed of your progress and events. Karen Johnsen for the Towne Family Association. Copyright © 2019 NORAH. All rights reserved.